The new OM-D E-M1X has fast burst modes and sophisticated image stabilization to capture extreme sports. Photography, right from the start, back in the 19th century, has been at odds with itself over which technology is the best one to use, ever since Louis Dague­rre and Henry Fox Talbot invented it in the very same year, 1839, using different processes. Since then, during those nearly 200 years, photographers have had to choose between standards—large format versus 35mm format or film versus digital, just to name a couple. But in these decidedly digital days, professional shooters aren’t faced with a new format just yet—virtual reality and augmented reality are still in the formative stages. However, what they do face is the dilemma of determining what system to migrate or upgrade to. For several years, Sony’s full-frame mirrorless cameras have been the camera brand of choice for many pro photographers. In response to Sony’s success, Nikon and Canon have both unveiled new full-frame mirrorless systems, followed by announcements from Panasonic, Sigma and Leica with their own versions. Now, in 2019, Olympus, a camera brand that’s been conspicuously quiet during these months of new full-frame digital camera system unveilings, has a new flagship camera announcement of its own: the OM-D E-M1X. In December of last year, I spent several days in Florida shooting with this new mirrorless camera. Here’s what I learned during my trip. 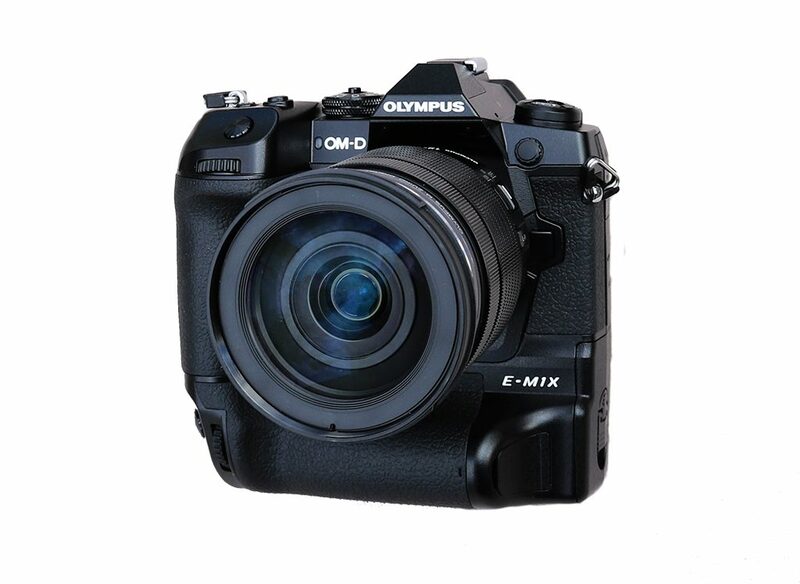 In my first meetings with Olympus, the company noted that it was targeting the OM-D E-M1X at professional photographers, saying the new camera would excel in several areas, including reliability, its autofocus system, high-speed performance and high image quality. However, there are two elements that will initially be a disappointment for some pros: The camera will not include a full-frame-size image sensor. Instead, it will have a Micro Four Thirds-sized Live MOS sensor. Additionally, it will be just a 20-megapixel digital camera, which will no doubt be enough megapixels for some street shooters and event photographers. However, some, who demand more flexibility for cropping or just to print larger-sized prints, will also find this a shortcoming. But are these deal breakers for pros? It depends, but in using the new camera, I did find a lot to like about it, including its high-quality electronic viewfinder and rugged build—it has extensive water seals as well as its dustproofing technology. Also, the battery is the same one used for its previous flagship, the OM-D E-M1 Mark II, but will use two batteries to power the camera. It also allows for USB Power Delivery support, which Olympus claims can charge two batteries in as fast as two hours. Olympus has enhanced the processing power, including eight processing cores, which allows, among other things, the ability to provide a robust image-stabilization system. According to Olympus, the built-in sensor-shift IS allows for seven stops of compensation, and with certain Olympus lenses with optical IS, you can achieve 7.5 stops. What’s particularly nice about this is that you could shoot at some rather slow shutter speeds and still capture decent images (provided your subject is static). Olympus says the OM-D E-M1X’s AF system is similar to its predecessor (OM-D E-M1 Mark II) with a 121-point AF system, which are all cross-type AF points. It also has on-chip phase detection AF. Additionally, Olympus claims this model is rated for 400,000 shutter actuations. One practical feature that pros will love is two memory card slots. At press time, the OM-D E-M1X will be sold in a body-only configuration for $2,999. 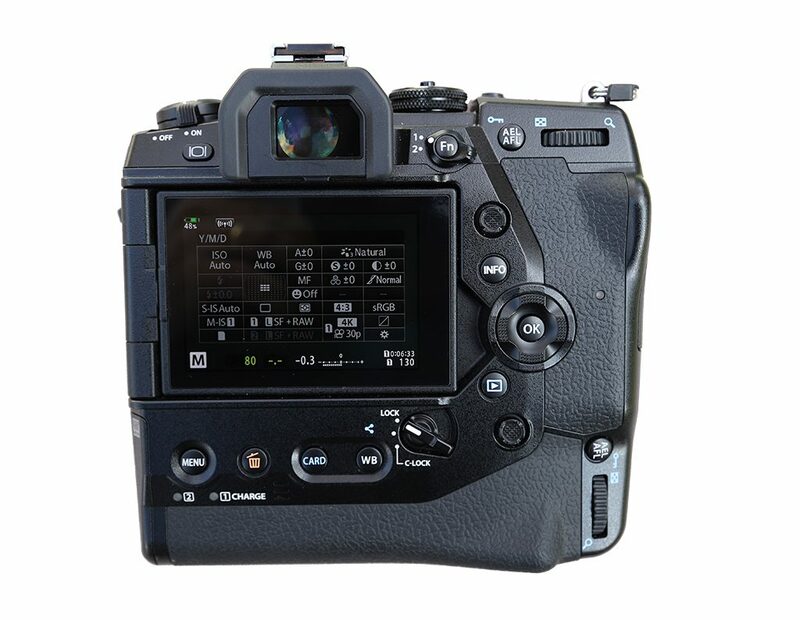 At this same time that it announced the OM-D E-M1X, Olympus has also announced a new flash, the FL-700WR ($379), a wireless radio wave commander (FC-WR, for $329) and a wireless radio wave receiver (FR-WR, for $219). Nevertheless, it’s a camera that feels good in your hands, and there’s a logical placement of ample physical controls and dials. One new physical control on the back of the camera is the easy-to-use toggle switch, which can be used without having to remove the viewfinder from your eye. So, in terms of the hardware, I think Olympus did an admirable job. the camera brands. There could also be some enhancements in creating more dynamic help features on the camera. During my trip and afterward, I found the OM-D E-M1X performed very well, allowing me to capture a wide array of images in various action settings. The camera didn’t seem to miss a beat in firing off 18 frames a second with continuous focus, including RAW. It can also fire off up to 60 fps, but that’s without continuous AF (or if you lock the focus before shooting the burst). There are robust burst modes that function in silent mode, too, allowing you to engage the electronic shutter instead of the mechanical shutter, which worked well. Overall, the low-light performance was pretty good on many images, although at the higher ISO, you’ll perceive some image noise that will soften sharp details. I had just a cursory look at the video features and performance, but so far, testing it with various lenses and making the most of the image stabilization, the HD and 4K video quality looked quite good. There are other enhancements, including adjustments to customizing AF settings (for instance, faster or slower AF adjustments) and a new OM-Log and a LUT (Look Up Table) for more professional-level video quality. The OM-D E-M1X also includes a variety of tracking capabilities to work in conjunction with the system’s continuous autofocus modes. During my stay in Florida, Olympus arranged for three different shoots in central Florida. All were based on action shooting to stress test the OM-D E-M1X. In each situation, we primarily used the low sequential shooting mode, which allows you to capture 18 frames per second with continuous AF. Shooting At Daytona Speedway: Although our shoot was cut a bit short due to rain, I found the OM-D E-M1X often captured the race cars with sharp, crisp details, particularly when I used the new Subject Tracking Detection AF feature. According to Olympus engineers, this new type of subject tracking technology is based on deep-learning or artificial intelligent algorithms that can quickly detect objects like race cars, airplanes, helicopters, trains and other types of moving objects. 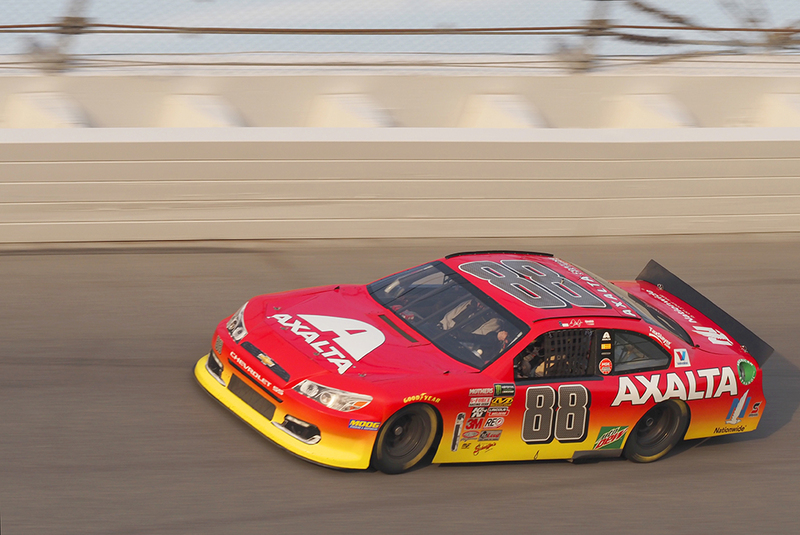 At the racetrack, the camera regularly picked up the cars and then adjusted the focus as it neared my vantage point. Since I was shooting in manual mode, I experimented with various shutter speeds and panning techniques, changing them on the fly in order to try to capture blurrier backgrounds to contrast with sharply rendered details of the car. I didn’t find, though, that the tracking worked every time, but I was still impressed with the technology. To capture the stadium, I also tried out the camera’s new Handheld Hi-Res Shot setting, which allows you to generate a larger, 50-megapixel image by moving the sensor around inside the camera while snapping 16 different images and stitching them together in-camera. In general, that feature worked pretty well, as long as the subject wasn’t moving. It’s a feature that previously required a tripod, but according to Olympus, because of improvements in the sensor-shift IS, you can shoot handheld high-res shots, as well. Shooting Supercross Bikers At Bakers’ Factory: Another shooting scenario that allowed us to stress test the OM-D E-M1X was attempting to capture the acrobatic routines of off-road motorcycle racers at Bakers’ Factory supercross dirt test track on a rainy Friday afternoon. I attempted to use the new Subject Tracking Detection AF to pick up and track the bikers’ focus. However, according to Olympus, that particular feature wasn’t going to work with supercross bikers. But I still used continuous AF to produce decent results. Again, I experimented with moderately slow shutter speeds while panning to enhance the sense of motion in the images, which for me produced mixed results (although this had to do more with my technique than the technology within the camera). Additionally, since the weather varied between light drizzle and steady rain, I was able to see just how well the camera performed in wet weather. It functioned very well. The only slight issue—a minor quibble, really—I wasn’t wiping the tiny water droplets off my viewfinder, which disengaged the auto eye-detection that allowed the camera to automatically switch to live-view display on the LCD when my eye wasn’t looking through the EVF. The droplets made the camera think I was using the viewfinder. 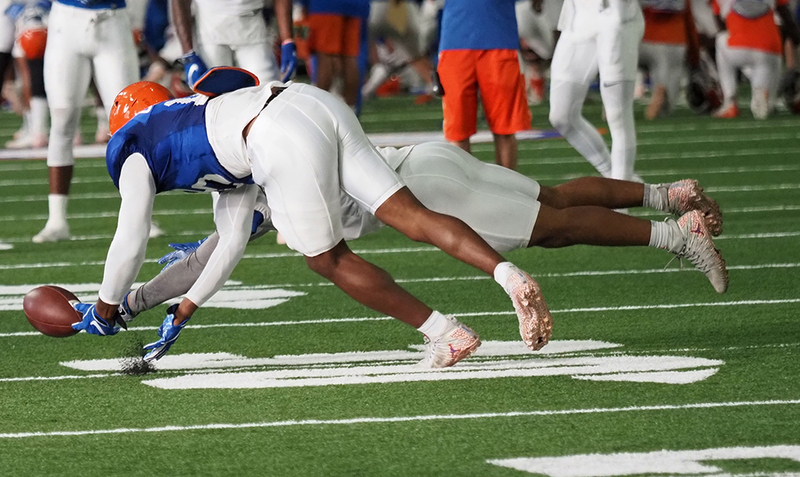 Shooting A Football Practice At University Of Florida, Sanders Practice Field: I again used continuous AF during a visit to a Gators football practice at the University of Florida. However, although it captured the action easily enough, in the slightly dimmer light of the indoor practice area, some of my action shots were softened a bit by image noise. Nevertheless, in my action shots of the football plays, I felt the various lenses performed adequately. Depending on what lenses you use, though, you might not achieve as much bokeh as you might on a full-frame system. For instance, the players might lack the dramatic blurry background you’ll find on, say, a Nikon D850, Sony a9 or Canon 5D Mark IV. Yet, that may also depend on which Olympus or third-party lenses you use. A less-expensive system than competitive full-frame systems. Overall, the system is smaller and lighter than full-frame or APS-C systems. Offers sophisticated, easy-to-use tracking technology. Higher quality and more versatile video capture than previous Olympus systems. Fast, accurate 18-fps burst modes, with continuous autofocus. Large and heavy for a Micro Four Thirds camera. While 20 megapixels may be adequate for some pros, others may require higher megapixel counts. Needs a more sophisticated menu system. In general, the OM-D E-M1X offers a lot of value but comes up a bit short in important areas, such as megapixel count. Another is that many pros will use Micro Four Thirds in challenging environments when they need portable lightweight models. And since this is a decidedly larger MFT model, some may choose to work with either other MFT cameras or use an APS-C or full-frame camera. Additionally, some pros may opt for the larger full-frame sensor, which will allow for more light and, in some cases, less image noise, even though in my hands-on tests, the OM-D E-M1X performed pretty well. However, I think this system is definitely worth a look for street shooters and event photographers. It also may be an excellent choice for young pro shooters or even for those in school looking to build up an inexpensive system. For event shooters who are looking for a more portable system, this camera may be ideal.